Tom Parker, an author and photographer from Blue Rapids, was the recipient of one of 10 WeKan! 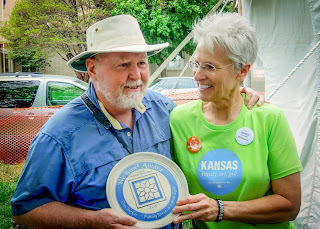 awards presented May 2 at the Kansas Sampler Festival in Wamego. The awards are presented to individuals or organizations that have made outstanding efforts to help preserve and sustain rural culture in their area. The Kansas Sampler Foundation chooses recipients who have a cooperative spirit, show enthusiasm and dedication for their community and whose efforts have made a real difference in rural Kansas. The award is a handcrafted plate made by Elk Falls Pottery. This is the twenty-third year for the WeKan! awards. Thanks, Bud! It was a shock to my system, let me tell you. Tom, I'm so happy to read this news. Congratulations! Proud of you!! Oh, this is wonderful! I can't think of anyone who could more deserve it. It's been wonderful, trailing along behind you, watching you work and learning so much: not only about Kansas, but about how to persevere. Congratulations! Thanks, Carol and Linda. The funny thing is that I was preparing myself to stop writing columns due to lack of time and or topics, but this renewed my interest in writing. I'll keep plugging away for a little longer, I suppose. Congratulations on a well deserved award! I have enjoyed your writing and photography! Keep putting Kansas in a good light!